BlackRock Inc. joined Pacific Investment Management Co. in recommending inflation-linked bonds and warning costs are poised to pick up. “Stabilizing oil prices and a tighter labor market could contribute to rising actual, and expected, U.S. inflation,” Richard Turnill, BlackRock’s global chief investment strategist, wrote Monday on the company’s website. “We like inflation-linked bonds and gold as diversifiers.” New York-based BlackRock manages $4.6 trillion. Federal Reserve Chair Janet Yellen will get a chance to give her views in a speech Tuesday at 12:20 p.m. in New York. Pimco, which manages the $87.8 billion Total Return Fund, and BlackRock have both told investors this year that inflation is picking up. Fed officials Stanley Fischer and James Bullard chimed in this month to say costs are increasing, driving speculation the central bank is moving closer to raising interest rates. The U.S. 10-year note yield fell four basis points, or 0.04 percentage point, to 1.85 percent as of 8:58 a.m. New York time, according to Bloomberg Bond Trader data. The 1.625 percent security due in February 2026 rose 11/32, or $3.44 per $1,000 face amount, to 98. The Treasury Department is scheduled to sell $34 billion of five-year notes on Tuesday, which yielded 1.35 percent in pre-auction trading. The BlackRock Inflation Protected Bond Portfolio has lost 1.5 percent during the past 12 months, while the Pimco Real Return Fund has lost 1.8 percent, based on data compiled by Bloomberg. Both funds were beaten by more than 60 percent of their peers. The Treasury market inflation outlook and oil prices have both risen from lows for the year set in February. A government report April 1 will show U.S. employers added 210,000 workers in March, after hiring 242,000 in February, according to a Bloomberg survey of economists. The difference between yields on 10-year notes and similar-maturity Treasury Inflation Protected Securities, a gauge of trader expectations for consumer prices, has increased to 1.55 percentage points from as low as 1.12 on Feb. 11. It’s still below its average of 2.08 for the past decade. 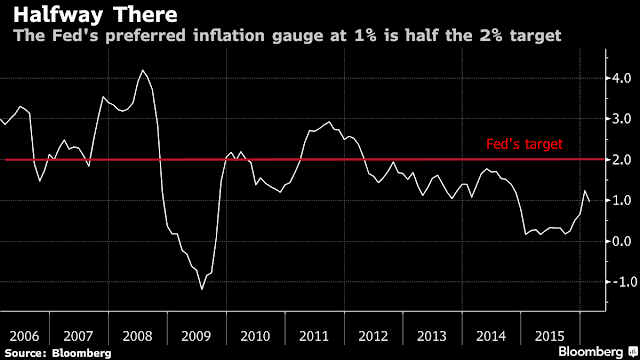 The Fed’s preferred inflation gauge rose 1 percent in February, a report showed Monday, half of the central bank’s target of 2 percent. something that we would like to happen,” Fischer, vice chairman of the Fed Board of Governors, said this month. Policy makers should consider increasing interest rates in April in reaction to a tightening labor market and the prospect of inflation overshooting the 2 percent target, Fed Bank of St. Louis President Bullard said March 23. He said in separate comments inflation hasn’t materialized as he expected. Fischer and Bullard both vote on monetary policy this year. The central bank’s next meeting is April 26-27. It probably won’t raise rates until September, futures contracts indicate.